If you're shopping for an enterprise-level multiprocessor server, you'll notice a new player with a familiar name: Intel Corp. The giant chipmaker, dominant in the PC and small server markets, is challenging RISC technology with multichip architectures built around Pentium III and Pentium III Xeon processors and Intel boards. Symmetric multiprocessing servers with Intel chips, made by several dozen manufacturers, have a lock on the entry-level and midrange portions of the market. Single and dual Pentium II and III units loaded with Microsoft Windows NT or Windows 2000 account for almost 100 percent of the market for entry-level print, file and appliance servers. Dual Pentium II, Pentium III and Pentium III Xeon servers have been edging out midrange systems based on IBM's Power PC, Hewlett-Packard's PA-RISC, Sun Microsystem's UltraSparc and Compaq's Alpha. Quad, or four-way, Pentium III Xeon units with the capability to support NT and Win 2000, Linux, Solaris, UnixWare, NetWare and other proprietary Unix operating systems also are finding success as high-performance midrange servers. And Intel has its sights set on the higher reaches of the enterprise market, with its new eight-way Profusion chip set and powerful 550-MHz Pentium III Xeon processors. 'Buy a unit that has as many processors as you can afford. 'Compare hard drive manufacturers' mean time between failure data as well as the rotational speeds and storage capacities of the drives. 'Use high-speed 40X or 48X CD-ROM drives. 'Choose redundancy options for maximum data security. 'Store backup tapes away from your servers in case of fire, flood or other catastrophe. 'Remember that Win 2000 and Linux are emerging as popular server operating systems and both offer multithreading for eight-way processing. Before Intel released its Profusion chip set last year, even the best-designed four-way Pentium III Xeon systems couldn't compete with RISC systems in the high-end enterprise marketplace. But the new eight-way architecture is prompting server manufacturers such as Amdahl Corp., Compaq Computer Corp., Data General Corp., Dell Computer corp., Hewlett-Packard Co. and IBM Corp. to reshape their product lines. For users, it means that multichip servers will soon be the norm, said Warren Wilson, an analyst with market research company Summit Strategies Inc. of Boston. 'Single-processor servers will essentially evaporate this year, as two-way designs become the new entry-level standard. Four-way servers will quickly gain volume to vie with two-way boxes as the sweet spot of the market, while eight-way Profusion-based designs will become a popular high-end option in 2000,' Wilson said. Other analysts say that four-way Pentium III Xeon platforms will continue to bridge the gap between midrange and small enterprise computing requirements, with the new Profusion systems being optimized for running very large database applications and decision support operations in large enterprises. The accompanying chart reflects the fact that there aren't many Profusion servers out there yet, but Intel expects that to change by year's end. The new Intel architecture incorporates an eight-way SMP CPU unit, a fast input/output subsystem and a large memory system. Three 100-MHz buses connect via a crossbar switch to the processor unit, I/O and memory. Two of the buses support a set of four CPUs each and the third connects to the I/O subsystem with cache coherency to reduce processor disruption. Intergraph's Zx10 Server holds two processors and can use up to 8G of RAM. GSA pricing starts at $3,194. The modular I/O system will support both legacy 32-bit PCI and new 64-bit PCI cards. Intel has said the Profusion chip set will support all current Pentium III Xeon processors and will also support future Cascades processors. The Profusion chip set memory interface is a dual-port synchronous design that uses commercially available PC/100 synchronous dynamic RAM on registered dual in-line memory modules for up to 32G maximum memory, with Expanded Subscriber Module-100A supported, in the platform. The memory bandwidth is 800 Mbps per port for a total bandwidth of 1.6 Gbps. Profusion is colorblind when it comes to compatibility with operating systems and applications. Most new operating systems, such as Windows 2000 and SCO Unix from the Santa Cruz Operation Inc. of Santa Cruz, Calif., are already optimized for eight-way SMP design, and many new applications have multithreading capabilities that will allow them to easily utilize the benefits of the new architecture. The Profusion design also provides hardware support for RAID, disk hot-swap and failure detection, dual failover and hot-plug PCI, temperature sensing for system components, redundant power and fans, and error-correcting code. Along with speed and fault-tolerance, scalability is a major requirement for server buyers. The upgrade path for Intel's Pentium processors is noteworthy, especially in the Pentium III series. Pentium III comes in two flavors: basic and Xeon. Both the Pentium III and Pentium III Xeon designs incorporate Intel's Streaming Single-Instruction, Multiple-Data Extensions that boost overall performance by maximizing CPU utilization for streaming audio and video, voice recognition and other processor-intensive applications. 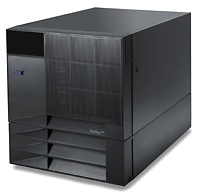 IBM's Netfinity 5500, with dual 500-MHz Pentium III processors and 10 hot-swap drive bays, starts at $4,865. The Pentium III processors with 512K of Level 2 cache memory are well-suited for fast desktop and entry-level server processing requirements. Most of the dual-processor servers listed here can run at speeds between 600 MHz and 733 MHz and are fast and powerful enough for duty as appliance servers and for some midrange applications work. The Pentium III Xeon processor is an enhanced version of the basic Pentium III, with more features and cache memory. 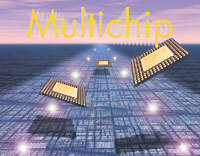 It is designed mainly for use in midrange and high-end servers. Most current Pentium III Xeon processors operate at 500-MHz or 550-MHz speeds, with even faster versions on the horizon, including a prototype 1-GHz version. These units come with 1M or 2M of Level 2 cache RAM, meaning they can store up to four times the data on-chip than can Pentium III processors with 512K of Level 2 cache. With greater Level 2 cache storage capacity comes greater speed, as cache memory gets data to the processor much more rapidly than data stored on a disk or in RAM. Pentium III Xeon processors also feature the Extended Server Memory Architecture, which allows applications to store up to 32G of main memory'soon to be 64G'greatly surpassing the 4G memory limit of NT. Users worried about upgrading their 32-bit Profusion Pentium III Xeon system to Intel's forthcoming 64-bit platforms such as Merced, which is due later this year, or later designs such as McKinley, Madison and Deerfield, might not have much cause for concern. A white paper from the Aberdeen Group in Boston suggests that the release of the Profusion eight-way architecture is part of a larger, long-range road map for the Intel architecture; users wanting eight-way capability will not be hurt in the long run if they buy now rather than wait.